Decorative Screening Panels are 6 ft wide x 2 ft high and come in range of visibilities. Materials include unfinished MDF, hardwood, pine veneer faced board, white PVC, brushed aluminum melamine, and unfinished mahogany or oak faced board. Panels can be painted and finished and are suited for furniture, interior walls, ceilings and doors, cabinetry, and store fixtures. OUTWATER PLASTICS INDUSTRIES, INC., Wood-Ridge, NJ - In addition to the wide selection of Wainscoting, Beadboard and Woven Wire Grille products currently offered, OUTWATER has just introduced its new series of DECORATIVE SCREENING PANELS. Intended to enable Furniture and Cabinet Manufacturers, Woodworkers and Builders to add a new and stylish flair to any type of paneling application, OUTWATER'S DECORATIVE SCREENING PANELS are ideally suited for diversified use as decorative ornamentation for Furniture, Interior Walls, Ceilings and Doors, Cabinetry, Store Fixtures, etc. Stocked in 13 different patterns (Each pattern is listed with its percentage of "open visibility") in Unfinished MDF, Hardwood and Pine Veneer Faced Board in 6' wide x 2' high varieties, the DECORATIVE SCREENING PANELS are also available in White PVC, Brushed Aluminum Melamine and Unfinished Mahogany or Oak Faced Board compositions as well. 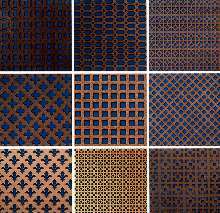 Suitable for painting or finishing, the DECORATIVE SCREENING PANELS can be utilized using the same tools as wood. Color pictorials and ordering information are available on the website. OUTWATER PLASTICS can be contacted Toll Free at 1-888-772-1400 (Catalog Requests); 1-800-631-8375 (Sales) or viewed online at www.outwater.com OUTWATER INDUSTRIES, with facilities in New Jersey, Arizona and Canada, has served its customers since 1972 as "the source" for in stock, ready-to-ship standard and innovative component products.